Welcome to the SQLSoft3 Press page. Need an interview? Need pictures or logos? If you need some assistance – please click here to contact us. SQLSoft3, SMB Nation, and Microsoft, have turned October and November into SQLSoft3’s Microsoft Azure Extravaganza with FREE Azure Webinars, deals on Guaranteed-to-Run Azure classes, and Azure certification assistance with discounted Microsoft Certification Exam Vouchers. 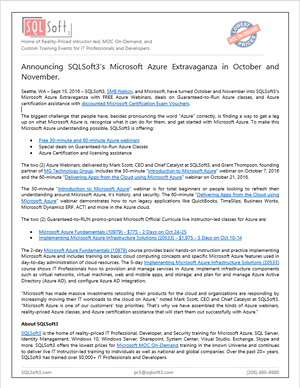 The two (2) Azure Webinars, delivered by Mark Scott, CEO and Chief Catalyst at SQLSoft3, and Grant Thompson, founding partner of MG Technology Group, includes the 30-minute “Introduction to Microsoft Azure” webinar on October 7, 2016 and the 60-minute “Delivering Apps from the Cloud using Microsoft Azure” webinar on October 21, 2016. The 30-minute “Introduction to Microsoft Azure” webinar is for total beginners or people looking to refresh their understanding around Microsoft Azure, it’s history, and security. The 60-minute “Delivering Apps from the Cloud using Microsoft Azure” webinar demonstrates how to run legacy applications like QuickBooks, TimeSlips, Business Works, Microsoft Dynamics ERP, ACT! and more in the Azure cloud. The 2-day Microsoft Azure Fundamentals (10979) course provides basic hands-on instruction and practice implementing Microsoft Azure and includes training on basic cloud computing concepts and specific Microsoft Azure features used in day-to-day administration of cloud resources. The 5-day Implementing Microsoft Azure Infrastructure Solutions (20533) course shows IT Professionals how to provision and manage services in Azure; implement infrastructure components such as virtual networks, virtual machines, web and mobile apps, and storage; and plan for and manage Azure Active Directory (Azure AD), and configure Azure AD integration. 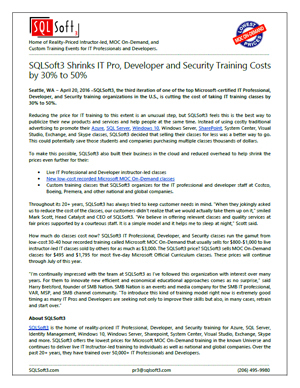 Seattle, WA − SQLSoft3, the third iteration of one of the top Microsoft-certified IT Professional, Developer, and Security training organizations in the U.S., is cutting the cost of taking IT training classes by 30% to 50%.